"He Took My Place" project at Echo Sound Studio in Pensacola, FL. This project was produced by Randy Shelnut, lead singer of the Dixie Echoes. Darrell is a prolific songwriter, and has written many of the songs that Darrell & Tojuana sing. I Just Can't Wait" was written during a time of trials for Darrell. "He Makes A Way". "Well Done" speaks of those words we long to hear our Savior say! "Mind Set On Heaven" and "Don't Give Up, Jesus Is Coming Soon" remind us to keep watching and waiting for Christ's soon return. All of these songs were written by Darrell and are included on their recordings. Coming to you from the Mississippi Gulf Coast, Darrell & Tojuana reside in Three Rivers, Mississippi, just a few miles from the snow white beaches of the Gulf. They have been married over 30 years, and have reared two sons, Wesley and Robert. At the age of 10, Darrell sang his first "special" at the church his father pastored in Toxey, AL. The song was entitled "Then I Met The Master", and Darrell was accompanied on the piano by his father. As a teenager, Darrell sang in a male trio, and later played bass guitar for a mixed quartet. Darrell has served as the praise and worship leader for two churches. Tojuana, at 9 years of age, began learning to sing harmony from her mother and grandfather. At the age of 13, she sang in an all-girl trio. The trio went on to win first place in the Mississippi State Assemblies of God Teen Talent Competition. 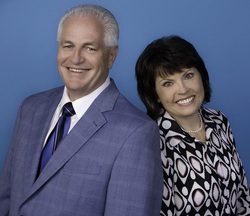 until the time she and Darrell married and began singing together in ministry.